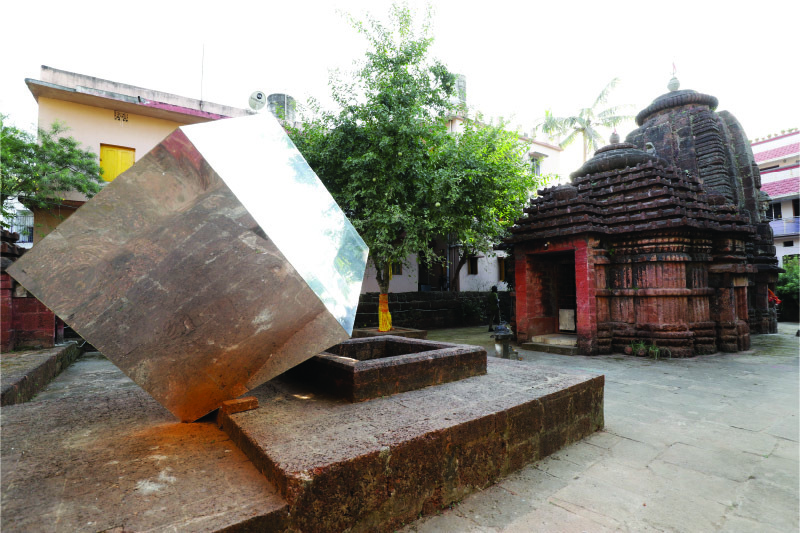 The Smart City as an Art City: Zeenat Nagree sets off on the first Bhubaneshwar Art Trail. Niroj Satpathy. Question Machine. Installation. 2018. The Old Town of Bhubaneshwar has narrow lanes that fork out towards one medieval temple after another. Some rather grand, and other smaller ones out of use, these ornate laterite and sandstone structures narrate complex stories about the developments in Hindu architecture and iconography, and trade and travel over centuries. The math complexes around the temples, some of which have their own ponds and ducks, are interspersed with residential buildings and schools, all crowding into one another. While tourists from the rest of the country stand in line to perform rituals, the biggest draw in the neighbourhood for locals is the Bindu Sagar, a tank maintained by the organisation that runs the impressive 11th century Lingaraja temple dedicated to Shiva. When I visited Bhubaneshwar in November last year, there was a new light show by the water during the evenings, a spectacle that had become part of the mix of images and objects of contemporary art installed for a month along a 1.3 km stretch of the Old Town. Called the Bhubaneshwar Art Trail, the event was organised by Jagannath Panda’s Utsha Foundation, from the 18th of November to the 18th of December, with support from the Orissa state government. Panda, who grew up in Bhubaneshwar, was the Trail’s co-curator along with art historian Premjish Achari, both of whom currently live in Delhi. The backdrop against which the Trail took place was crucial to the making of the works since all the artists were invited to spend at least a month in the city to realise their projects. At times the artists responded to the site directly, or made use of the site in unexpected ways, allowing the audience to look at it as they may not have before. Subrat Kumar Behera installed paintings inside small shrines, presenting temples as galleries and creating a point of intersection between different modes of making. The paintings featured the microcosm around – worshippers going in and out of tanks or praying to a deity – but there also seemed to be subtle critiques of these circuits. In one work, a man drinking water from the well by the temple appeared diseased with a pot belly and tumorous protrusions on his skin even as Shiva watched the scene from above. Tradition was not trashed entirely, neither were the corrosive effects of caste brought to the fore in Behera’s work, but the possible dangerous effects of its organisation were highlighted. 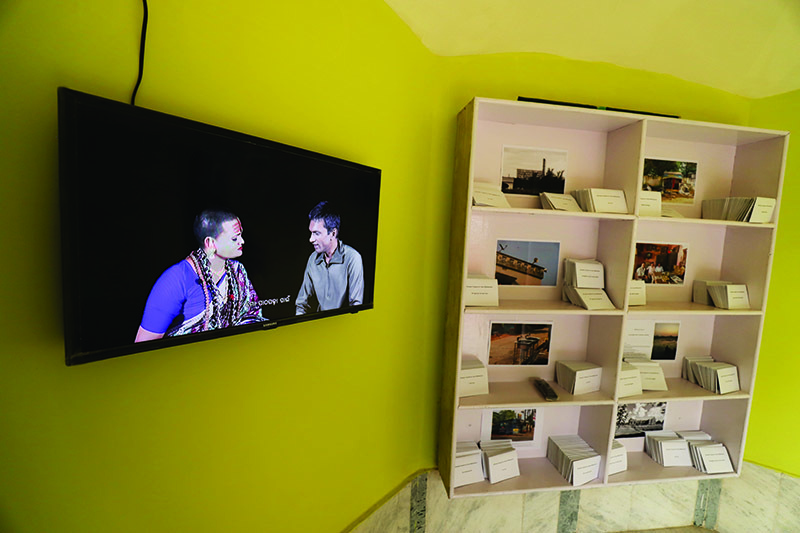 In Veejayant Kumar Dash’s Paka Kambala, Pota Chhata, an installation inspired by a narrative trope in Odia literature of having a servant ask his master questions about the world, the present-day realities of living in the Old Town were brought into focus. Dash interviewed locals about their daily concerns and included this footage in his installation that took its cue from the words of the master, “…spread the blanket on the ground, and cover it with the umbrella.” Dash used the space to hold public meetings during certain days of the Trail. Material from the area featured prominently in a number of pieces, including Cecile Beau’s fish constructed from used diyas, Arunkumar H.G.’s sculpture made from chariot wheels and M. Pravat’s large laterite orb. Arnika Ahldag. Alternative proposals to future Bhubaneswars. Printed text/photos. 2018; When futurity collapses into contemporaneity. Vieo. 2018. Many of the curatorial choices seemed to suggest that a shift in the modes of looking can create different possibilities of engagement. 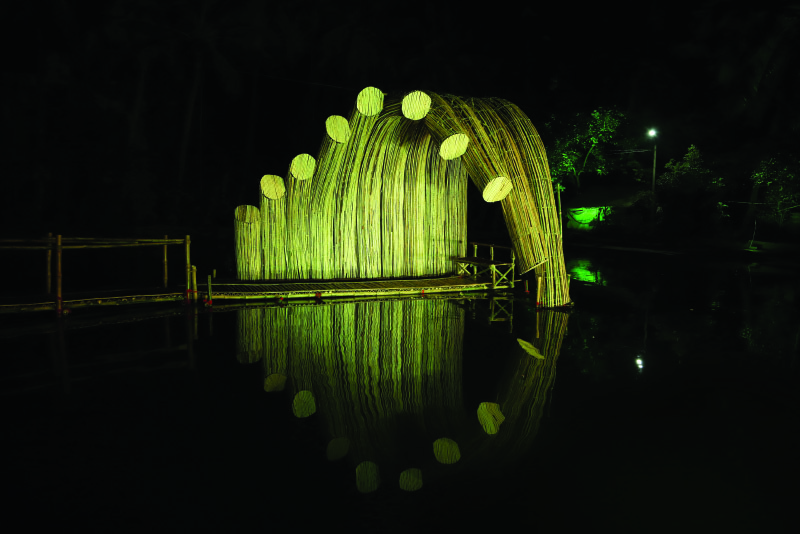 Sayantan Maitra Boka’s Duck Above, Fish Below, a viewing platform on a lake made from bamboo, made us see the temples from a vantage point that is otherwise not available – the pond. The structure was dismantled at the end of the exhibition. Sibanand Bhol’s Liminal View, which looked like a giant lingam with a hole in it, a strange fusion of the symbols of Shiva/Shakti worship, had a view of a temple in the distance. We were being made to look and look again differently as expressed in the title of the Trail, “Navigation is Offline.” The curators wanted to address the virtual flatness of our contemporary experiences owing to the prevalence of screens that act as barriers to our access to the world. The Trail brought audiences into enclosed spaces of classrooms, living rooms and shops in addition to the temples and their compounds. The organising team had garbage dumps cleared and boundary walls painted to present the neighbourhood anew to the residents themselves. These acts of renewal were a necessary and hopeful response to the mandate given to Utsha Foundation to “come up with a vision for a role of art in the upcoming ‘smart city’ project” as outlined on their website. Sayantan Maitra Boka. Duck Above, Fish Below. Installation. Bamboo. 2018. Images courtesy the Bhubaneshwar Art Trail.